While taking full command of the moment, Oprah let those watching in Cupertino and at home know that there’s never been a moment like this, and then proceeded to talk about what she brings to the table, even though in 99 percent of conversations involving Oprah, she IS the table. To drive that point home, the stock for Weight Watchers went up almost 1 percent when she hit the stage, according to CNN. Granted, shares came back down to earth while she was up there indicating something else was at play, but I’m gon’ go ahead and let Oprah’s soul glow and shine through. Auntie O spoke about her content deal with Apple, which will include two documentaries, one unnamed and one called Toxic Labor. She will also be revamping her famous Oprah’s Book Club making it “the biggest, the most vibrant, the most stimulating book club on the planet.” She didn’t say the most lit, but we can all read between the lines here. Also, pun!!!! Because Oprah is the biggest boss that you’ve seen thus far, Apple lets her do her thing in new and innovative ways, and also doesn’t interfere with her work at OWN, where she’s out here bodying the game with awesome content like Queen Sugar, which ZOMG! is coming back soon! 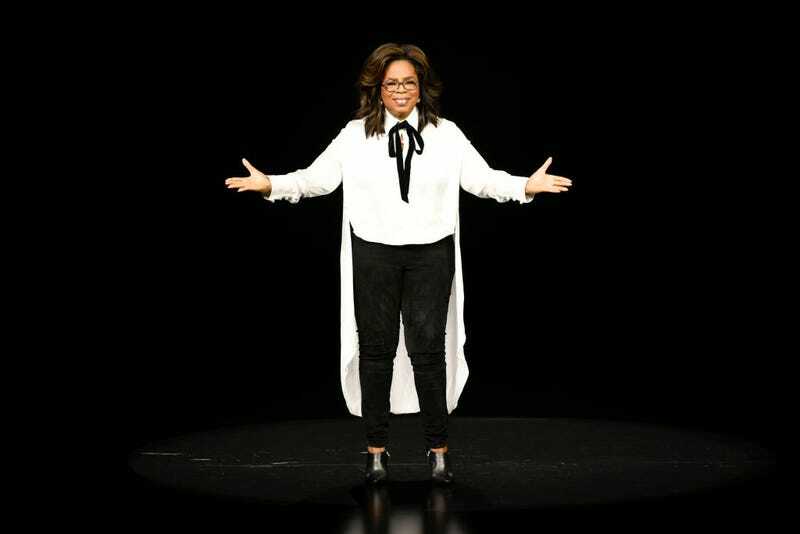 While Oprah has yet to bring her brand of daily talkshowism back to the main stage, she’s been killin’ the game in many other multi-faceted ways, showing you and yours that OWN isn’t just a network, but a way of life. Now let me go and write me a book and hope Oprah wants to add it to her book club. In the meantime, can somebody pull her coat-tail to Damon’s book?